Horse Ground Training – Tie Back While Longeing? I rode and owned a horse on my grandfather’s ranch in my teens and did some barrel racing and trail and am just getting back into riding 30 years later. I’m wondering if the training method below is cause for concern. He saddles the horse and takes her to the longeing pen. He hooks the rubber tube on the left bit ring and the front saddle cinch ring. He has the horse walk and trot about 10 laps, then switches sides and does the same on the right. Then he stops the horse, attaches the tube between the bit and the back ring of the saddle. At this point, the horse is looking sideways, almost to the rear. He has her walk and slow trot about 5-7 laps, switch sides same thing on right. My trainer says her problem side is her right side, so she is tied around on the right side from bit to back ring to “stand” for 15 minutes. I then ride her about 30-45 minutes. This pattern is done daily, at minimum 5 days a week. I’m concerned because sometimes she starts “spinning” in a circle and has to be stopped and started again. She has run into the wooden fence many times. This is a huge topic. I can’t see the training session in person although you did a good job of outlining it. In an email reply, I’m sure I’m not going to hit all the bases. But here is some information that I hope will be helpful. Since it is your trainer doing the tie back, I am writing to trainers in general, not to you specifically. All bending lessons should be mastered with a halter and lead rope before a bridle. Bending exercises should be done in hand before longeing or riding. Bending lessons are more effective when they are combined with forward movement. And a general training rule – if something is not working (as in 5 x a week, every week and still same stiffness), the trainer needs to stop doing it, step back, take a time out and look at what you are doing, evaluate, change. Repeating something over and over and not getting results just doesn’t make sense. There are much more effective ways to teach a horse to bend. If a horse resists bending, it is likely that some of the ground training has been skipped. Ground training exercises related to bending include this one but there are many more. Send the horse out on a 10-15 foot line and turn the horse in toward you to change the horse’s direction of travel. Do this again. You’ll see right away that in one direction the horse hurries and is stiff when he turns while in the other direction he will likely make a real pretty symmetric rhythmic walk around turn. Do this back and forth (it becomes almost like a figure 8 or a bow tie) until the horse relaxes both ways. This is the equivalent of a change of rein when you are riding serpentines, small figure 8’s, that sort of thing, a sweeping curvy type of turn, very balanced, relaxed, rhythmic. Do the same exercise near the arena rail and ask for the turn and change of direction just as the horse is leaving the rail. This makes him do more of a turn on the hindquarters as he changes direction. I’ve seen dramatic positive results in practicing this exercise with green horses and even use it to warm up my saddle horses before I step on. Now as far as using reins of some kind while longeing, side reins can be a useful tool to help balance, flex and bend a horse but they must be used with great discretion and experience. Less is more. The situation you describe is not really side reins, but related, so I wanted to mention that side reins, when properly used, can help a horse learn how to carry himself better. But they are usually used in pairs and never tightened to such an extreme as you describe. 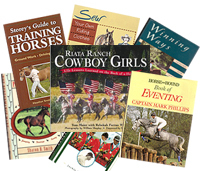 Specifically to your horse’s training program – It seems to be a common training practice. As you describe it above, there are a few things that are OK but some not OK things going on too. Using flexible rubber for “side reins” – if you are going to use them flexible is good. Using them (at least in part of the session) while the horse is moving forward. If a horse is so resistant (or fearful or uncomfortable) when bending yet it seems that this method is necessary to be used 5 days a week, I’d think that some training basics were skipped somewhere, such as in-hand work and work in a halter. I’d also suspect that the horse’s mouth might be sore from this every day regimen………and/or it is getting dulled to it all. A horse should never be tied so short so that it is “looking sideways, almost to the rear” and being asked to go forward on a longe line. This just doesn’t make sense. Tying a horse around to one side and making him stand is a dead-end as far as I’m concerned and certainly invites the spinning you mention. When you train a horse to bend, you want him to bend moderately and in balance, not overbend. Overbending, like overflexing, can turn into a real avoidance problem later on. One of those “it will come back to bite you” situations. It takes time to make a good horse but it is time well spent. Flexibility is the range of motion of a joint. A rider must be especially flexible in the pelvis and hips. The rhythmic movement of a horse can improve your flexibility because the movement of the horse closely approximates the movement of your pelvis during walking. That is the basis of hippotherapy, a form of physical therapy that uses a well-trained and balanced horse to improve a person’s posture, balance, muscle tone, mobility, and function. The older you are, the more time and attention you will have to spend to ensure that you are comfortable during riding and after. It is best if you work stretching into your everyday life. I have the following rule written on the activity board in my barn, “Make things less convenient”. More than one person has asked me, “What the heck does that mean??! !” It is just a way of reminding myself that convenient is seldom better when it comes to maintaining flexibility. So I design some of my barn chores (and office and domestic tasks) to be less convenient. I walk out to feed each horse on pasture twice a day; I put frequently used items on the top shelf so I have to stretch to reach for them; I bend over to use a short brush and pan to pick up manure and debris in the grooming area. You can use isotonic exercises to tone and stretch your body. Isotonics are exercises in motion, the kind you probably have done all of your life. Perform these exercises with slow, steady stretches. Bouncing can dangerously exceed a tissue’s extensibility and result in injury. The quadriceps stretch – to improve flexibility of the large muscles on the front of the thigh. If quads are tense, they may prevent you from developing a long leg as you ride. Stand on one leg (you may need to grasp a support) and grab your other ankle with the hand on the same side. Smoothly pull your heel toward your buttocks. Keep your back straight and extend your hip (downward). Hold. Repeat with the other leg. You can do this exercise before you mount, during a break, and after you ride. Hamstring stretch – to lengthen the large muscles at the back of the thigh for a deep seat and long leg. Stand keeping one leg straight. Bend the other leg slightly at the knee and move its foot around the front to the floor on the outside of the other foot. Bend at the waist and reach for the floor. You will feel the “burn” at the back of your straight leg. Side stretch – to elongate the side of your body, especially beneficial for a rider with a collapsed side. With your feet hip-width apart, raise one hand over your head. Reach for the ceiling as you stand on your tiptoes and feel your entire side elongate. Lunge – to strengthen the quadriceps and stretch the gastrocnemius and Achilles tendon for “heels down”. Place one foot 2 feet ahead of the other. Bend the knee of the front leg, keeping the back leg straight and the back heel on the floor. Hold your arms out to your sides, horizontal to the floor, keeping your back straight. You should feel a strengthening in the quadriceps of the front leg and a stretch of the gastrocnemius and Achilles tendon of the back leg. Repeat with other leg. The stirrup stretch – to improve the balance, coordination, and stretching of the obliques required for mounting. With one foot flat on the floor and the opposite hand on your hip, raise the other leg with the knee bent so the thigh is at least horizontal. Reach the opposite elbow toward the knee. Hold. Repeat with the other leg. Symmetry stance – to improve your overall balance, symmetry and poise. You’ll need a mirror or a friend to critique you. With your feet placed wider than your shoulders to approximate the position on a horse, arms out horizontally from shoulders, tuck your buttocks as if to sit. Keeping your lower back straight, squat as far as you can toward the floor while keeping your correct position. Regulate your breathing. Calf stretch – to stretch your gastrocnemius and Achilles tendon in order to help you ride with a long leg and low heel. Stand with your knees straight and the balls of your feet on the edge of a 2-4-inch step. Let your heels stretch down. Hold five seconds. Rest or raise above the step on your toes. Back stretch – to stretch your lower back and hamstrings for preventing a hollow back. Lie flat on a floor or mat. Bring one or both knees to your chest. Clasp your hands around your upper shins and hug your legs toward your chest for a better stretch. Keeping your back flat, slowly raise your head and touch your nose to your knees. Hold for five seconds. Slowly uncurl. Repeat. Don’t forget to breathe. Lower back relaxer – to stretch and relax your lower back and hamstrings and round your lower back. This exercise is convenient in the arena or along the trail. Use it before, during, or after riding. With your feet flat on the ground, squat so your seat reaches for your ankles. Clasp your arms around your legs, rest your chin on your knees, and let your muscles relax. Once you have practiced this relaxer, you will find your body remembers it and will automatically configure in that position when you squat to put bandages or boots on your horse’s legs or to clip his legs. Abdominal strengthener – to tighten and strengthen the abdominal muscles for protecting your lower back as you ride. With knees bent and feet flat on floor, your back, shoulders, and head flat on the floor, point your arms forward toward your knees. Exhale and slowly begin lifting your head, one vertebra at a time, to raise your shoulders off the floor. Inhale as you let yourself down just as slowly. Lateral leg lifts – to improve the range of motion of the hip joint and to strengthen the thigh muscles for effective leg aids. Version A. Lying on one side, support your upper body with a bent elbow. Keeping your lower leg extended on the floor, raise the other leg. With your foot parallel to the floor, alternate extending your toe and heel. Version B. In the same position, bend your upper leg and place the foot on the lower leg at the knee. Raise and lower the lower leg. The added weight of the upper leg creates more work for your lower leg. Hip stretch – to stretch and relax some of those difficult-to-reach hip and buttock muscles that can get tight as a result of riding. Sit on the floor with your legs in front of you. Bend one leg at the knee and cross that foot over to the outside of the opposite thigh. Draw the leg close to your body, keeping your back straight. Hold. When it comes to riding, be sure to warm up both yourself and your horse. Take it easy. Don’t risk injury. Here is one of those situations where the slower you go, the faster you will get there. Tack your horse up and lead him around the arena or use longeing or ground driving to warm him up and be sure you get plenty of walking and stretching in before you mount up.